Featured / Recipes / 15.09.2018. Brodetto, locally known as brodet, brudet or brujet is a meal prepared of sea fish. You place in a dish a row of oily fish, tomato, onion, garlic, but also dark grapes. This interesting combination of flavours is completed with fine white wine and olive oil. 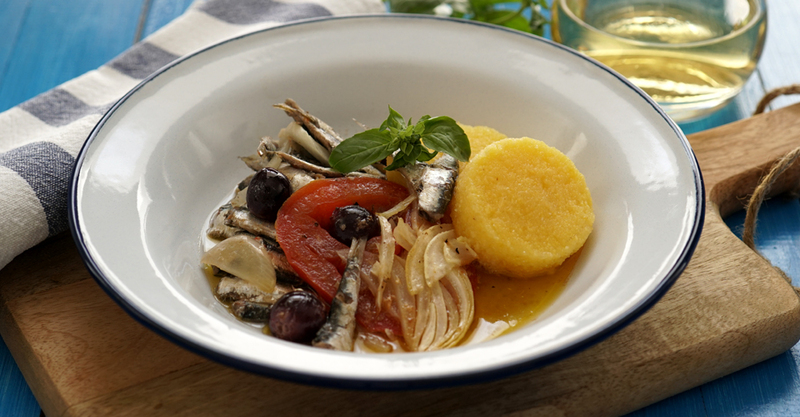 Serve with cooked polenta. Cut off the heads and innards from picarels or sprats and dry them. Wash and slice the tomatoes. Wash the grapes and separate them from the stem. Clean and slice the onion and chop the garlic. In a deep and wide dish (earthenware, Pyrex or ceramic) pour some olive oil at the bottom and then distribute the picarels, sliced tomatoes, grapes, sliced onions and chopped garlic. Add salt and pepper. Cover with remaining oil, wine and vinegar to which you added 50 ml water so that all the ingredients are well covered in fluid. Simmer for about 40 minutes. If the brodetto is a bit sour, add some sugar.